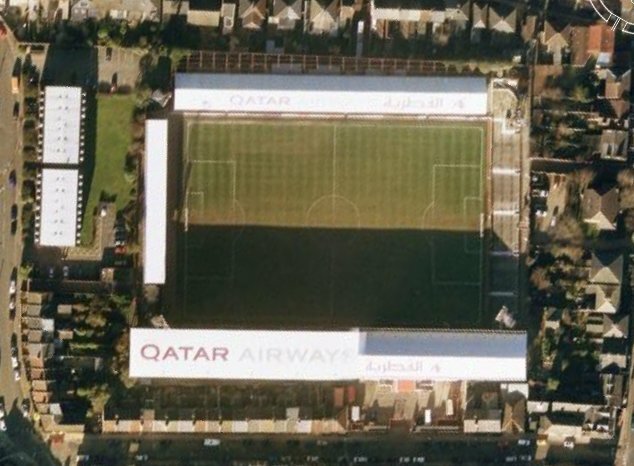 Take an aerial tour around Griffin Park (requires Google Earth). Away fans are located in the Brook Road Stand at one end of the ground. Usual ticket allocation is 1600 of which 600 seats are in the upper tier and 1000 are in the terrace below. Exit M25 at junction 15 (s/p M4, Heathrow Terminals 1,2 & 3, London (W)) onto the M4 eastbound. After 8.3 miles exit M4 at junction 2 (s/p A4, N and S Circular A406 (A205), Chiswick A315), onto slip road down onto the A4, which runs underneath, and parallel to, the M4. At Chiswick Roundabout after 0.7 miles. Take 4th exit (s/p S. Circular A205, A316, M3 Richmond) onto Chiswick High Road/Kew Bridge Road. Straight on for 0.3 miles to junction/lights (Kew Bridge Junction). Here, keep in lane for the A315 and go straight on (s/p Hounslow, Brentford A315), towards `The Plough'. At lights after 0.5 miles turn right (by McDonalds) into Ealing Road, which runs past Griffin Park. Over Kew Bridge to the Kew Bridge Junction. Here turn left (s/p Hounslow, Brentford A315) into Kew Bridge Road. At lights after 0.5 miles turn right (by McDonalds) into Ealing Road. 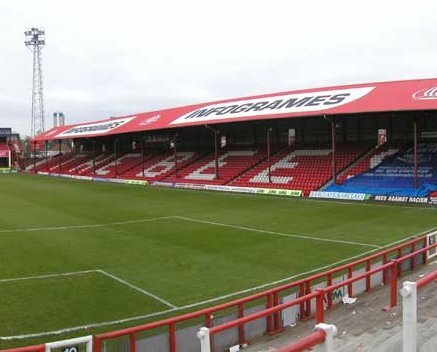 The nearest train station to Griffin Park is Brentford which is a 5 minute walk away. There is a car park near the groud. Turning into Ealing Road off of the A4 the car park is immediately on your right. Coming away from the ground on Ealing Road towards the A4, it is the last left-hand turning before the lights. The car park is manned and remains open between 11.30am and 7.30pm. 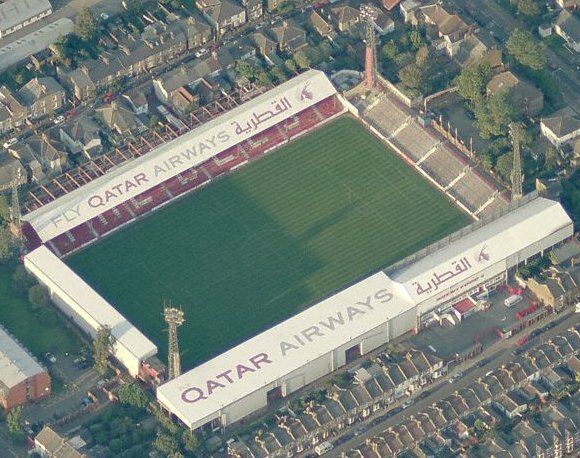 Email us to recommend any local attractions near to Griffin Park and we will list them here. 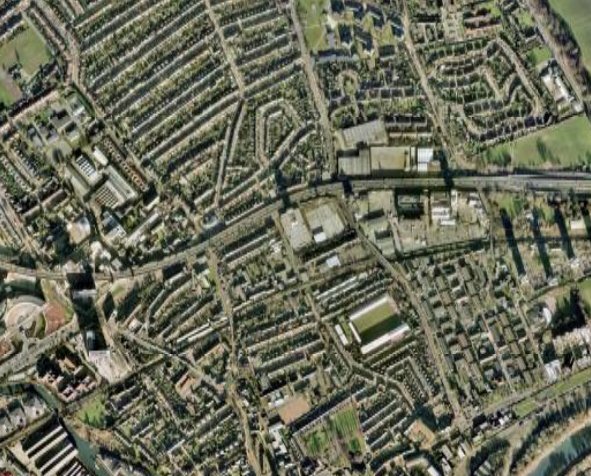 Brentford is unique as Griffin Park has a pub on each corner of the ground. They are the Royal Oak, The Griffin, The Princess Royal and The New Inn. 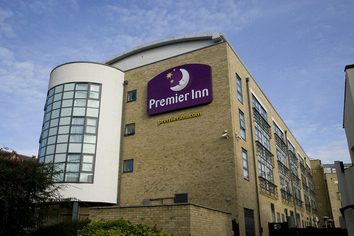 The New Inn is recommended for away supporters. Email us to recommend any pubs and restaurants near to Griffin Park and we will list them here.